The Russian improved Kilo Class diesel electric submarine Rostov-on-Don (B-237) launched cruise missiles at targets in Syria today, from a submerged position in the eastern Mediterranean. 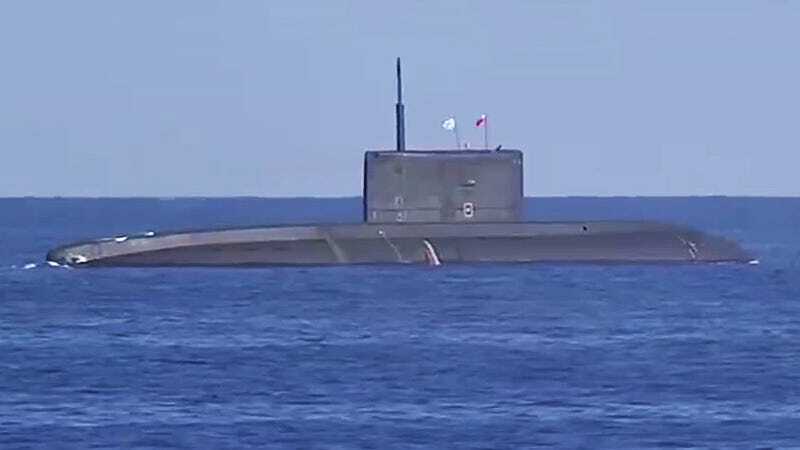 This is the first time a Russian submarine has struck targets in Syrua since Russia began its aerial offensive around October and the first time a Kilo Class fired cruise missiles in anger. The missiles involved were likely the 3M-14 Klub-S/Kalibr submarine-launched land attack missile, which is roughly equivalent to earlier versions of the U.S.-made BGM-109 Tomahawk land attack missile. It has a range of around 1,200 miles and packs a 1,000 pound warhead. The Russian Ministry of Defense reports that two targets near the ISIS defacto capital of Raqqa were struck with via the sub’s missile attack. Similar missiles, although surface launched variants, were employed from the Caspian Sea against targets in Syria in early October, flying across Iran and Iraq to hit their targets in Syria. As to how reliable they were remains debatable, but American cruise missiles of a similar capability had their fair share of failures too. Although they make for cool videos, these cruise missile launches, like the others from the air and the ocean’s surface, are wasteful uses of standoff weaponry. They are aimed at showcasing Russian capabilities on the world stage, especially to potential weapons customers, and for domestic propaganda consumption purposes. There is simply no need to fire standoff weaponry when Russia has free-run of Syria’s airspace. You can read all about the misconceptions surrounding Russia’s air war in Syria here. Still, seeing a relatively cheap (about $250 million per copy) improved Kilo Class, a submarine that has been exported around the globe, launch a barrage of cruise missiles is a reminder of just how big of punch these little budget-minded diesel electric boats can pack.